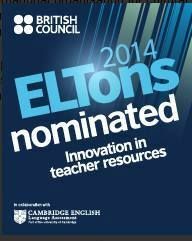 Again and the third time in a row, I have been nominated for ELTons in Innovation in Teacher Resources; and this time with my dear collageue Jennifer Verschoor. We have been nominated for our e-book, My First Digital Journey that was published by the Round last year. Great to be shortlisted again. Good luck to everyone! And may the best man win!